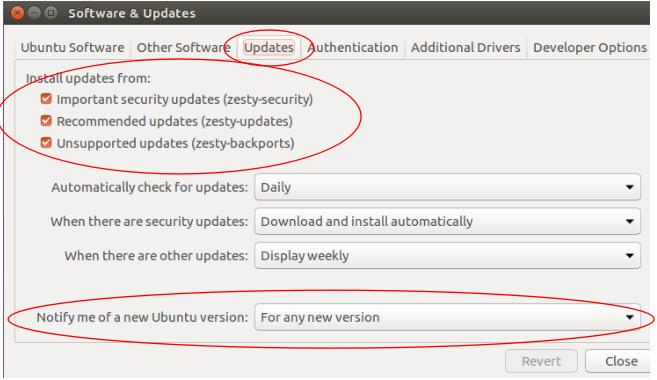 Today, April 13, 2017 a new final version of Ubuntu 17.04 released by Canonical Ltd named as Zesty Zapus. 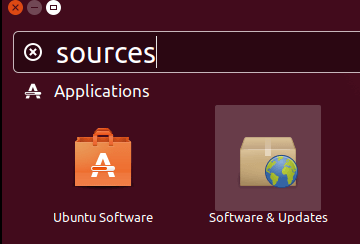 Ubuntu releases continue with well know naming scheme of adjective and an animal starting with the same alphabet letter. We are at letter Z now and the name of Ubuntu 17.04 is Zesty Zapus. Animal named Zapus is a North American jumping mouse. Support for AMD Ryzen and Intel Kaby Lake. 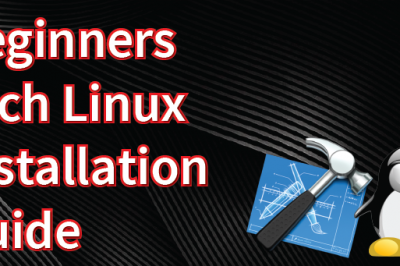 If you have newest processors, the Linux 4.10 kernel is included and supports them. Swap partition in the default install is replaced by swap file. Now installer automatically makes a swap file in / partition. 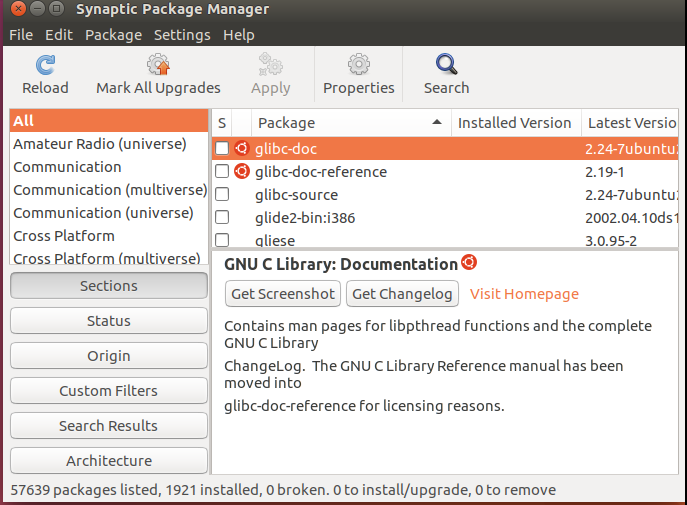 Upgraded programs in base install including LibreOffice 5.3, GNOME applications bumped to version 3.24, except terminal and Nautilus which will stay at 3.20 and Software which is 3.22 for the time being. Unity 8, the Canonical's next-gen desktop environment based on Mir display server is not default choice, but it is shipped and available to select in login screen. Maybe for the last time, as it is getting replaced by GNOME in the future. For gamer audience, X server is updated to version 1.19.3 and Mesa 17.0.2. This brings improved performance with Intel and AMD open source graphics driver, which come included. No need for install. Proprietary NVIDIA driver is as usual available. 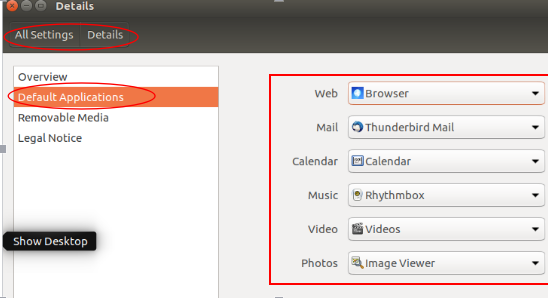 Set the "Notify me of a new Ubuntu version" drop down menu to "For any new version". Update Manager should open up and tell you: New distribution release '17.04' is available. The upgrade should take some time and after it, you should restart the computer and you are good to go. Swap file is, as you see, about the same size as RAM. Note : Swap file is created only for new fresh installation. If you upgrade you need to keep your existing swap partition. Next in a row would be openssh-server. This will enable you to have ssh connection from other computers, something that Canonical does not enable by default for security reasons. Next thing you would need is MS core fonts, libav codecs, unrar utility. This all is included in package called ubuntu-restricted extras. You would probably need java as well so you can install OpenJDK with the following command. To make your computer useful for content creating and/or engineering, you can install following packages. 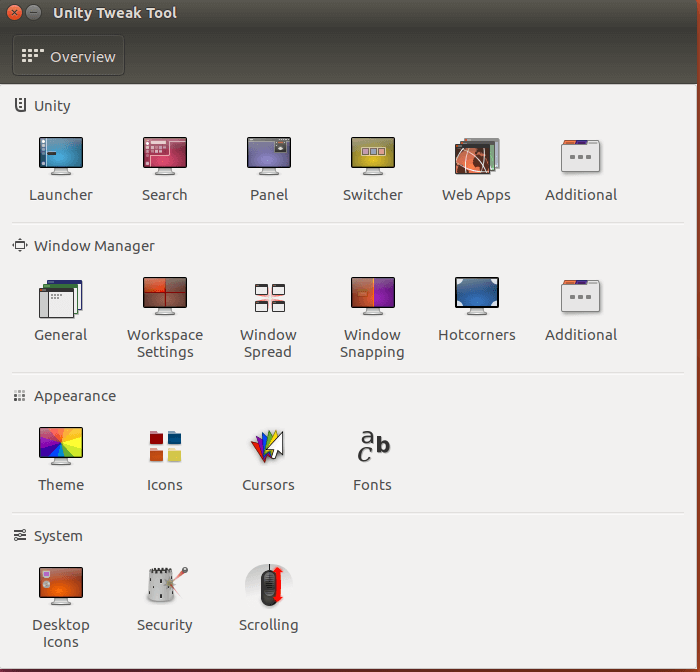 Default desktop is still Unity 7. It is nice enough, but you might want to make it more useful to your specific needs. You might used to having the dash at the bottom rather than on left side, so let's first start from that. 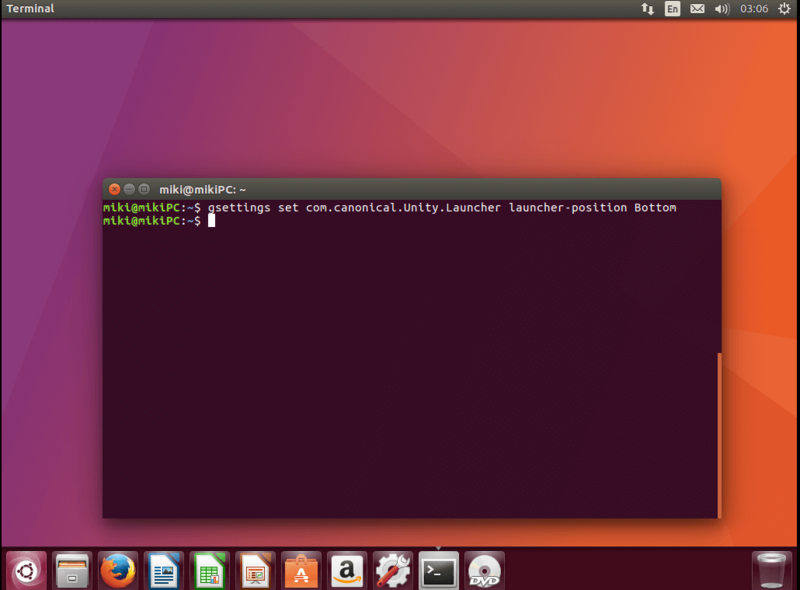 This command will move the launcher to the bottom. If you want to simplify the tasks of deleting your browser cache, cleaning up broken packages and similar maintenance tasks, you can install bleachbit package. 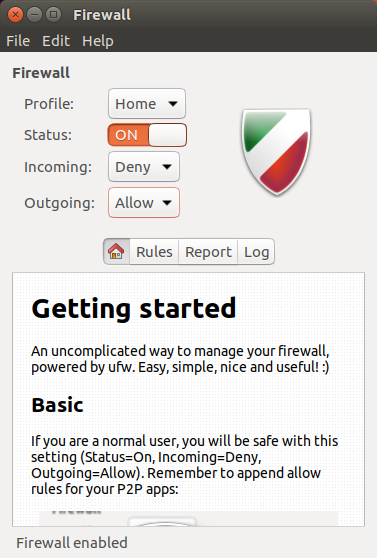 Ubuntu comes with ufw, which is simple command line interface for netfilter framework. It is simple enough but you have to use the command line. If you want GUI, there is gufw, which we can install in a moment. It requires netstat to work properly, which is part of net-tools package. To easily do more tweaks, you can install Tweak Tool. These days cloud storage is all the rage. Google Drive does not provide linux client, instead you can use web interface. But Dropbox provides very good client and here is where you can get it. 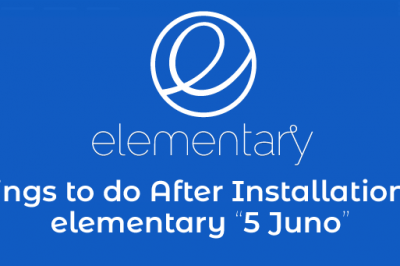 Install is straightforward whether you opt for headless install in command line or you download the deb and install it with GUI. To make you connected with your coworkers, friends and family, you probably need several different messaging programs. 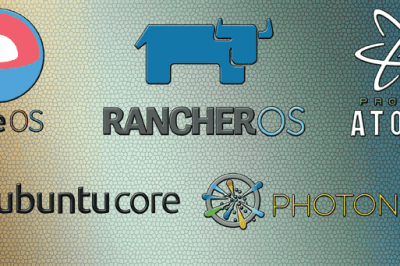 Skype, Viber and Telegram all have Ubuntu packages available and easily installed. After installing your own applications like vlc, geary, google chrome, it is possible to use them as the defaults applications to open respectively the associated contents. It can be useful to lock the terminal to the launcher in order to use it easily if you don't remember the key shortcut to launch it. 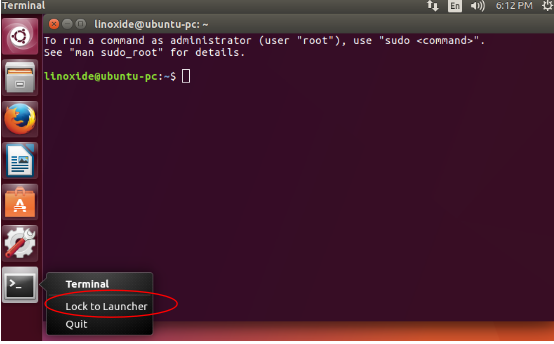 To do it, launch the terminal by a search on the dashboard, do a right click on the icon of the terminal to the dashboard and select "Lock to Launcher"
In Ubuntu and Linux in general, you have the possibility to have some workspaces. It is like virtual desktop that you launch to run an application independently. It is also a solution which can help you to best organize your activities without confusing; for example, you launch firefox on the workspace 1 while you are running jhipster on workspace 2 and you are playing a fun game like chromium-bsu on workspace 3. You can have a direct view of all the applications launched in each workspace. With desktop icon to the launcher, you can switch directly to Desktop from the current application or window. You can use combination "Ctrl + alt + directional keys" to switch workspaces. So we have introduced the newest Ubuntu 17.04 Zesty Zapus. If you expected revolution and Unity 8 by default, you might be disappointed, especially with latest news, that Unity is getting shelved altogether in favor GNOME. But in as it is Zesty is a rock solid release with a decent amount of new features. 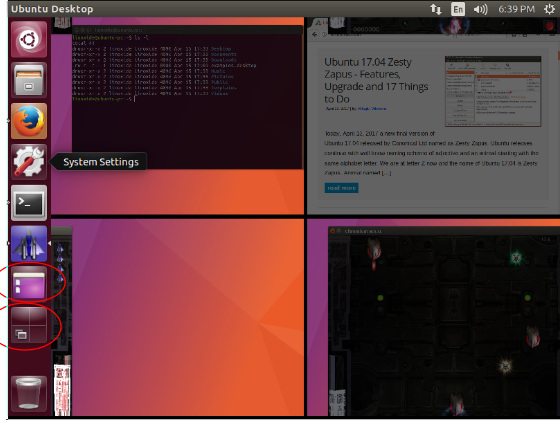 I have updated all my Ubuntu machines to Zesty by the time it was beta, and there were no big showstopper bugs. Unity 8 and Mir are more useful as well, although not yet ready for production. Unity 8 remain most touchscreen friendly desktop environment for GNU/Linux. 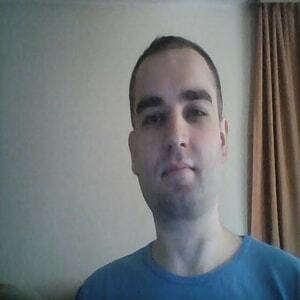 With that we close this review, thank you for attention and have a nice day.